Once we were close the place was easy to find. The whole street outside the tap room was filled with people. Standing in groups. Chatting. Drinking. A small bar had been set up outside where two different beers on tap were served. Inside the selection was a lot bigger. The lines for both bars, inside and outside, were long. The bartenders very busy. I recognised a friend working behind the bar out on the street. I got in line, wanting a beer. AQ Bevolution has been importing American Craft Beer to Japan since 2012 and now also has a bar in Tokyo, Titans Tap Room. When we went to Titans Tap Room in September 2016 it was actually their four year anniversary. For the first four years they did beer imports, the tap room had only been open for a short time when I visited. 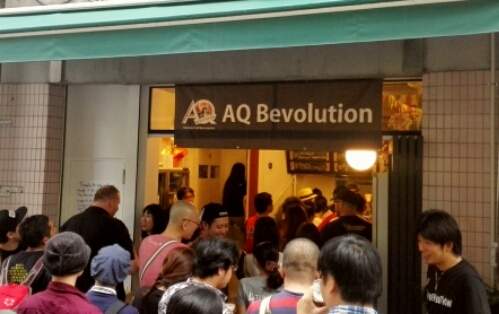 AQ Bevolution aims to revolutionise the Japanese beer market, introducing different beer from the watery lagers that have been enjoyed for so long. When I made it to to the front of the line my friend did not have much time to talk. Only a quick hello when he saw me, then he took my order. I gave him 500 yen, he handed me the beer and immediately turned his attention to the next one in line. I walked away from the bar, looking for the guy I came with. Titans Tap Room was an interesting bar. It had a large selection of beers, and quite the selection of places to enjoy the beer as well. 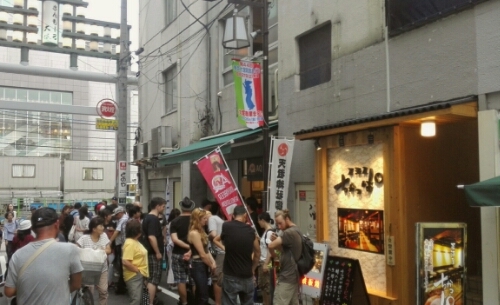 Today many people were outside in the street. Standing in groups. Talking. Drinking beer. Inside, the ground floor was a standing bar. A long counter, the bartenders working hecticly behind it. No seats in front of the bar. Only standing. The first floor was more of a Japanese room. No chairs. Just pillows to sit or kneel on on the floor. A low table in the middle of the room which creates a very social vibe. Everyone sitting in a circle. The second floor was decorated more like a western bar. High tables and bar stools to sit on. Sitting by the window gave you an excellent view of the street. I was travelling with a friend from Norway at the time. We had just been to Akihabara to try the Go Karting there. He probably likes beer more than I do so a visit to Titans Tap Room was perfect. We found an empty table on the second floor where we sat down with our beers. We both got our smart phones out, opened our unTapped apps. Ready to check in some beers. 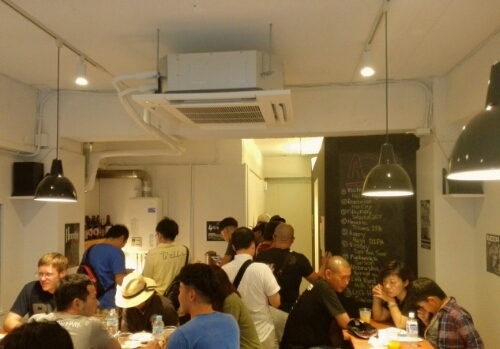 Titans Tap Room in Otsuka, Tokyo is an interesting concept. A bar with different atmosphere on the different floors. Different ways of drinking. Standing by the bar for a quick beer downstairs. Or lounging in a very social setting on the first floor. Or a more traditional western bar setting on the second floor. They have a great selection of Craft beer and the prices are not too bad. With Otsuka Station on the Yamanote Line only minutes away it is very easy to reach. If visiting Tokyo this is a great spot for enjoying some excellent craft beer. Visit the AQ Bevolution website. This entry was posted in Japan and tagged bar, beer, craft beer, tokyo on April 6, 2017 by Traveltorgeir.